Somehow, January became "Patriotism Month" at the movies. Maybe it's counter-programming to the "liberal Hollywood elite films" running for the Academy Awards. Maybe viewers have wised to the fact that z-grade horror films released this month will be trash. Regardless of the reason, American Sniper, Lone Survivor and now 13 Hours shoot for box office glory by depicting American heroism. 13 Hours fictionalizes the events of the 2012 attacks on the US Consulate in Benghazi, Libya. As depicted in the film, the US outpost is woefully under-equipped to handle the chaos following the fall of Muammar Qaddafi's regime. To complicate matters, the consulate is a cover for a CIA stronghold a few blocks away. While the consulate attempts to win hearts and minds of the local population, the CIA keeps tabs on the movement of Qaddafi's weapons. James Badge Dale, John Krasinski, Max Martini, Pablo Schreiber, Dominic Fumusa and David Denman play independent contractors, mercenaries, hired to act as security for the CIA base. Their characters, unfortunately, are largely interchangeable. They frequently make teary eyed video calls back home. One has a baby on the way. It's pretty rote stuff. They're archetypes, and they more or less work as such. Despite the solemn proceedings of the film, the six contractors quip in action movie style. The six observe that both the consulate and the CIA base are sitting ducks for any serious insurgency, a high probability in the unstable Libya. David Costabile plays the pinhead CIA chief, who almost consistently makes dunderhead decisions. He's part-bureaucrat waiting for authorization from his "higher ups," and half punching bag for the frustrations of the lead characters and the audience. It is no secret to anyone who keeps a pusle on current events that four Americans wind up dead in an attack on the Benghazi compounds on September 11, 2012. The six contractors fight off wave after wave of assailants for 13 hours in attempts to wait for evacuation... hence the film's title. Unlike in American Sniper, there are friendly locals in 13 Hours. Unfortunately during the siege, the US contractors can't tell who are the "good guys" and "who are the bad guys." Some Libyans are pro-American, some aren't. The team can't tell which is which, likely an accurate account of the situation. No one on the team speaks Arabic, yet another oversight. The CIA stronghold is right next to a sheep slaughtering ground. Actual or artistic touch, it's an ironic choice for a film about doomed people. The film is tense and exciting in all of the traditional action-thriller ways. Despite being January, 13 Hours has some of the most thrilling fight sequences American cinemagoers are likely to see this year. Though Bay's rapid editing occasionally creates disorientation, this also works to covey the confusion of the events in questions. On face value, director Michael Bay is an odd choice to film such a controversial event as the 2012 attacks. His biggest franchise is the toy-centric Transformers series. On the other hand, his films have always had an air of American Exceptionalism. Hot, shirtless American male bods get plenty of screen time here. Hyper-commercial director Bay has traditionally jammed his films with product placement, and here his eye creates a subtle yet bizarre world. Anti-American soldiers sport Western brands. Lunatic warmongers will likely take the film as a cry to bomb anywhere "not America." The film itself, however, doesn't hate Libyans and it isn't a call for war. It doesn't try to understand the situation there either, and that's probably the point. Even right-wing films are sick of being in unwinnable quagmires. The film posits that being in Libya was a mistake in the first place. Once Americans are on the ground, the film is utterly disgusted by the fact that they aren't given the tools they need to stay safe. A homicidal mob might be the ones shooting at the Americans, the real villains are those in Washington who abandoned the Americans in Libya. Jets sit on the runway. Calls aren't answered. The film doesn't say America could have brought democracy to Libya. It does say no Americans had to die. If more detail was given to Ambassador Stevens' plans, who died in the attacks, as well as some of the friendly locals, the film might have been more nuanced. Trying to suss out the "correct" way America should have responded is beyond the scope of this review. Good luck trying to interpret even the Wikipedia page much less the attack itself. It works as an action thriller, and it works as pro-American propaganda. 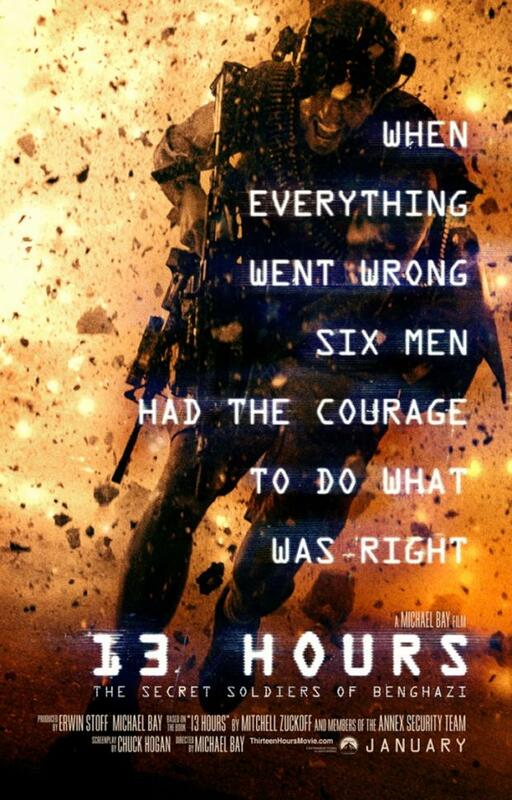 13 Hours is better than it has any right to be.